What a Mom Really Want for Mother’s Day? Mother’s Day is celebrated in honor of the mothers. It is celebrated every year in USA and in some other countries on 2nd Sunday of May. Anna Jarvis, three years after her mother’s death, held a memorial ceremony to honor her mother and trademarked the phrase “second Sunday in May” and “Mother’s Day”. Today, it is celebrated all over the world where children or husbands present gifts to mothers in their honor and as a way of saying thank you for all that they do. Just because she doesn’t ask for it, it doesn’t mean she doesn’t want it. This infographic cracks the code for what you should gift your mother this Mother’s day. 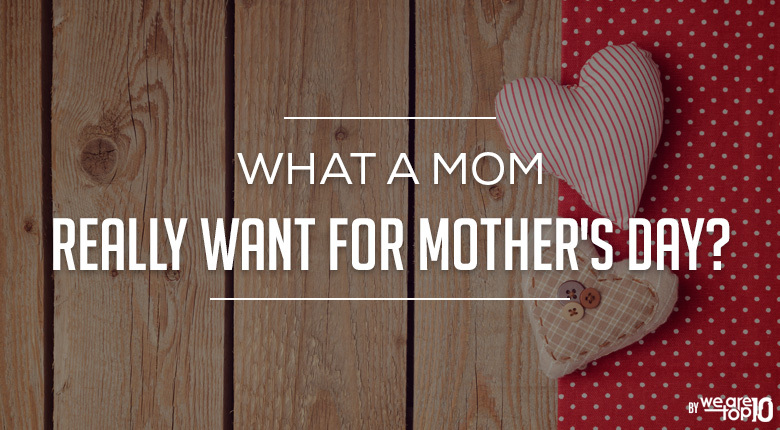 To make it easy, we’ve found the most common type of moms and what they really want. The Rosy Mom: Make her feel as fresh as a daisy this Mother’s day by spoiling her with a bouquet of her favorite fresh-cut flowers. The Stressed-Out Mom: Nothing says, “Thanks for putting up with me Mom” like a good ol’ foot rub! Or face rub, head rub, whatever will make her stress melt away! Find some great deals from massage oils to equipments here. The Bold and the Beautiful Mom: If your Mother loves watching tv seasons, make her life a little easier with a robotic vacuum cleaner – and get her a subscription of Amazon SHOWTIME. The Sassy Mom: Don’t cramp her style; celebrate it with her favorite perfume or classy pearl necklace. Seriously, she won’t even believe it was your idea. Which…it wasn’t…but hey, what she doesn’t know won’t hurt her! The Emotional Mom: Spoil her with an overdose of hugs, abundance of kisses (cheek is ok) and perhaps some chocolate, so Mother Lion can take her mind off of Mufasa’s untimely death. The Jumpy Mom: The best thing you can do for your jumpy Mom this Mother’s day is to get her some noise-cancelling headphones, so she can relax. The Adventurous Mom: This one’s for the young-at-heart Moms out there. If your Mom’s the one convincing YOU to go shark-cage-diving, perhaps you should send her on the epic getaway of a lifetime. The Shopaholic Mom: If your Mom has a gift for maxing out her credit card quicker than you can say “Happy Mother’s Day!”, then maybe you should give her a gift card of sorts, giving her poor credit card a break. The Modern Mom: If your Mom loves hashtags more than Kendall Jenner does, then maybe you should encourage her love of modern technology with an epic gadget to go with her epic personality, like an apple watch so she can take easy pics on the go, or a tablet so she can play Candy Crush on the move. The Model Mom:And finally, if your Mom always looks so on fleek. Contribute to her evergreen fashion sense with her favorite designer handbag or Gucci Boots. They were made for walking, and she’ll never stop talking – thanking you of course!